On Thursday, October 27, 2016, the grade four and five students in Ms. Moir’s class (Division 5) went on a field trip to Spuzzum, B.C. to visit the territory of the Nlaka’pamux Nation (ing-khla-kap-muh). 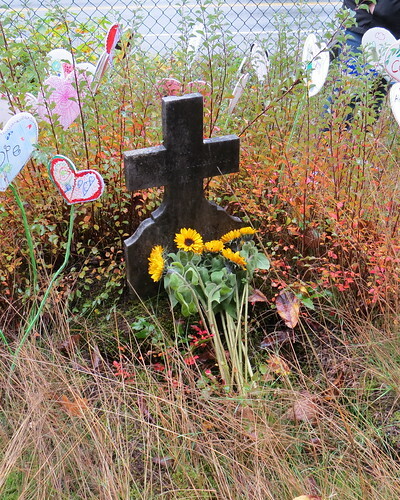 The class took flowers and hearts (made by our students) to the cemetery of an aboriginal girl (Gladys) we have been learning about. Gladys went to residential school in Kamloops. We then went on a hike in the local provincial park down to the old Alexandra Bridge before visiting the local General Store and having an ice cream before heading home.Gail Stromquist, author of the Gladys Module, and another BCTF staff member, Nancy Knickerbocker, accompanied us on the trip. Ms. Knickerbocker is a journalist for the BCTF and she interviewed and took pictures of our students. The article on our trip and the work the students have been doing should be published early in the new year. After returning to the school, students wrote letters to their parents expressing their feelings and thoughts about the trip. Their letters are on display alongside the “Heart Garden of Reconciliation” display in the hallways outside Division 5. We are very proud of the amazing empathy, knowledge and caring our students have expressed.